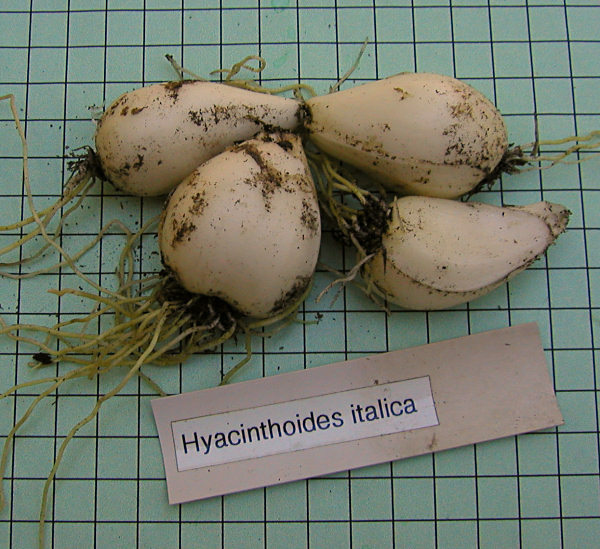 Hyacinthoides is a genus in the family Hyacinthaceae. 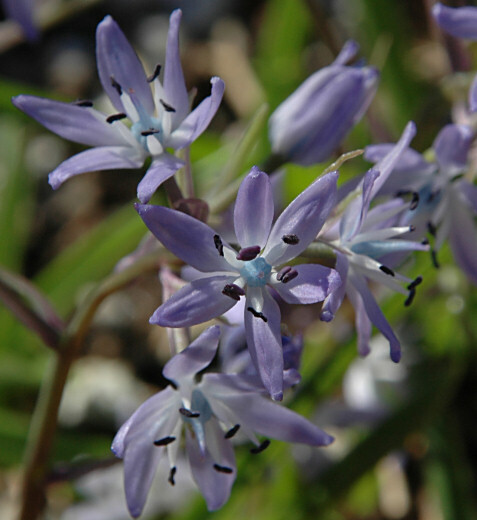 The species in this genus have had several names (Scilla, Endymion) and have reverted back to a previous name. 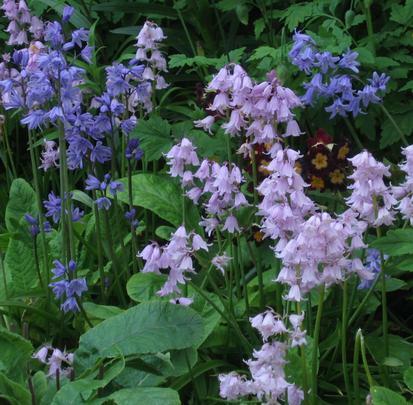 Commonly known as Bluebells or Wood Squills these are woodland plants with bell-shaped predominantly blue lavender flowers. 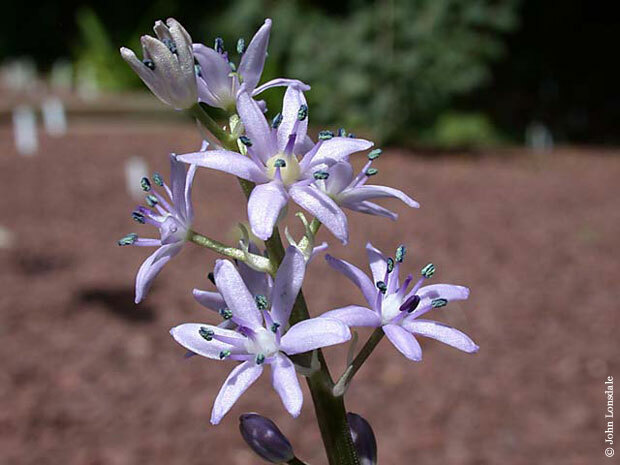 They are distinguished from Scilla by the bulb being renewed yearly and having each flower subtended by two (rather than one) bract. 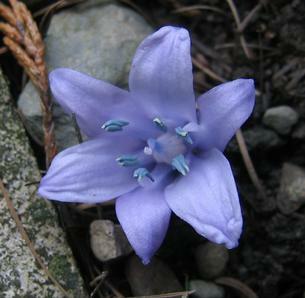 Jerry Flintoff discussed this genus in his introduction to Scilla when it was the topic of the week. 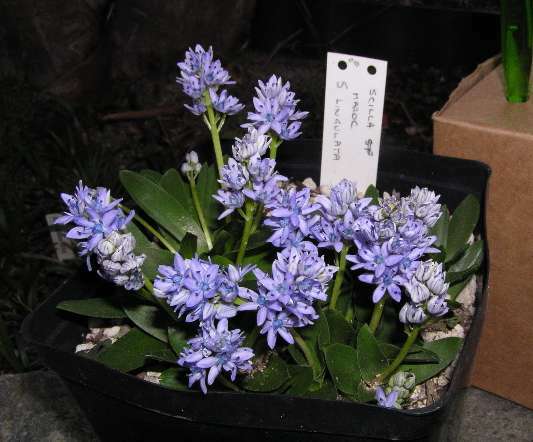 Hyacinthoides aristides is a dwarf species. 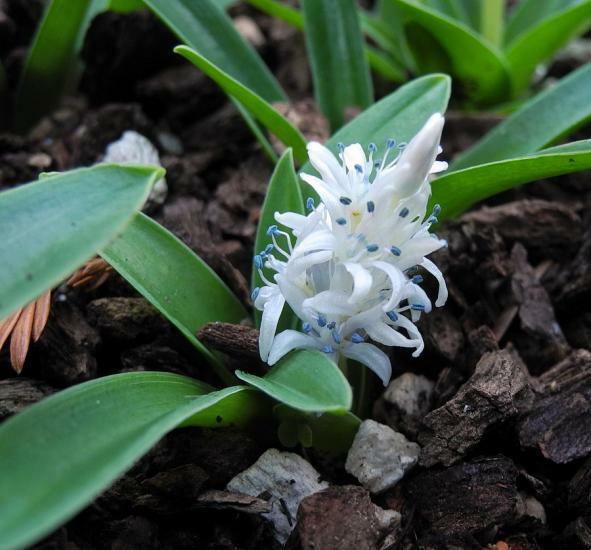 Photos by Rimmer de Vries, who writes this is the earliest Scilla-Hyacinth type plant to flower in the year, blooming for me in early March 2013 as the latest flowering form of Hyacinthoides lingulata was finishing; my plant came from Paul Christian, who reported it had descended from an I. Schneider collection made in a oak forest near Yakouren, Algeria. 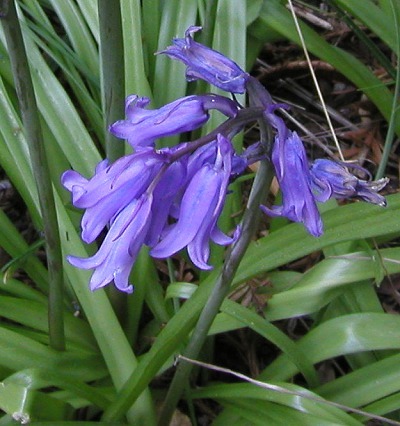 Hyacinthoides hispanica syn. Endymion hispanicus, syn. 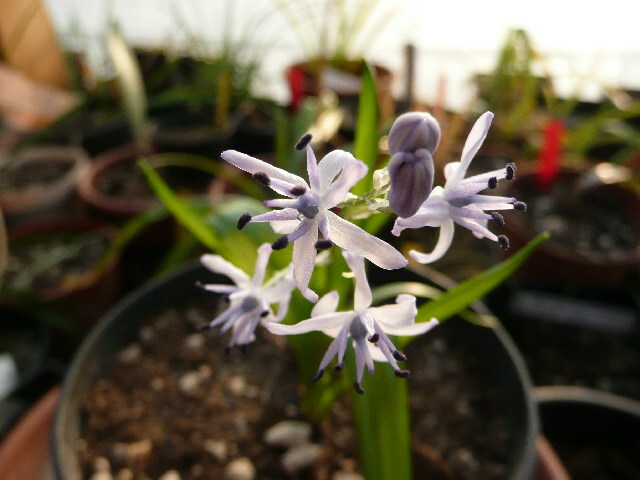 Scilla hispanica is the tallest and broadest leaved species with unscented bell shaped flowers scattered along the stem. 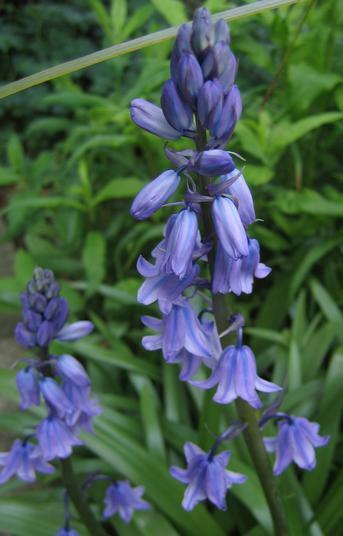 It is native to Spain and Portugal and to northwest Africa and is often referred to as the Spanish bluebell. 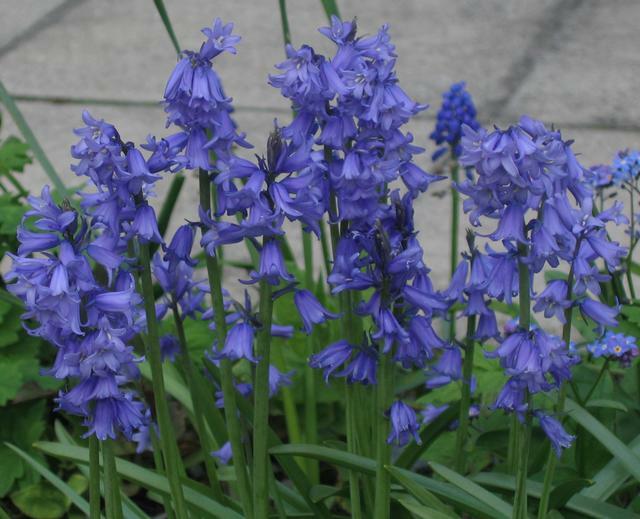 It is known to hybridize with Hyacinthoides non-scripta and there are garden cultivars available in pink, white, and blue. It is considered to be an excellent garden plant that naturalizes or is an invasive weed, depending on your opinion, in situations where it is happy. 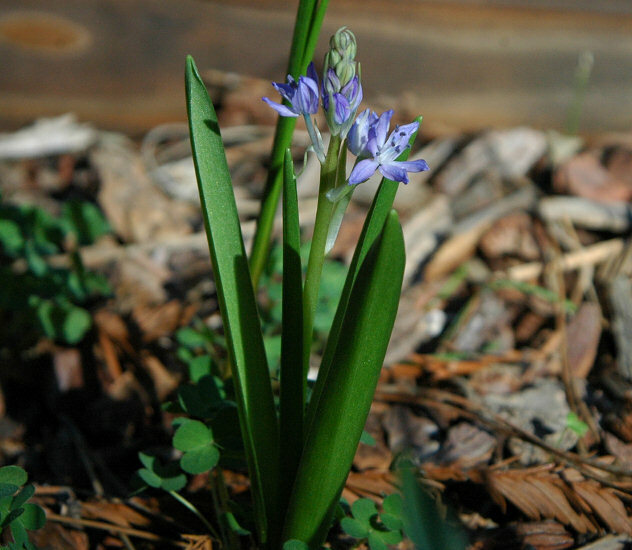 Apparently distinguishable from Hyacinthoides non-scripta by upright, not nodding, scapes. Photo 1 from Max Withers who captured it growing in a California garden with other plants that can become weedy in Mediterranean gardens: Allium triquetrum, Centranthus ruber, Chasmanthe sp. and Oxalis pes-caprae. Photo 2 taken by Eugene Zielinski at Cerro Santa Lucia, a city park in Santiago, Chile. Photos 3-4 from Mary Sue Ittner. 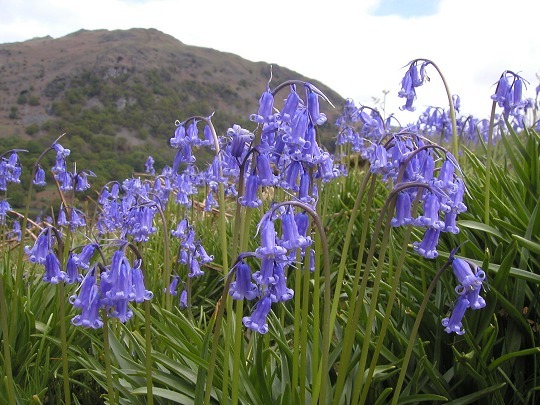 Hyacinthoides italica, known as the Italian Bluebell, is found in France, Spain, Italy, and Portugal where it grows in rocky places. 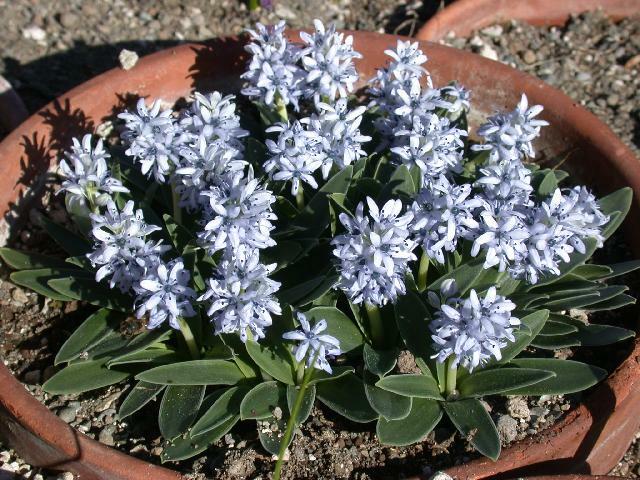 This is a smaller plant than the other more commonly grown species, but I think it is very charming with the intricate blue and purple starry outfacing flowers. Photos 1-3 from Mary Sue Ittner show the plants in bloom February and March in different years. 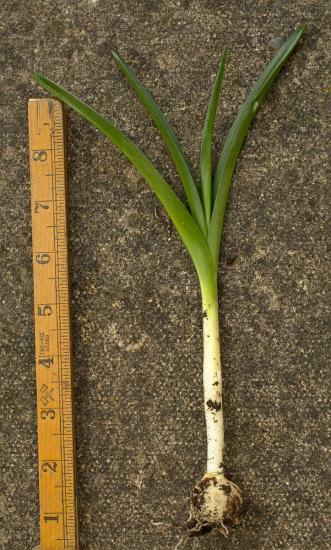 The last is a picture of the bulbs on a 1 cm grid. 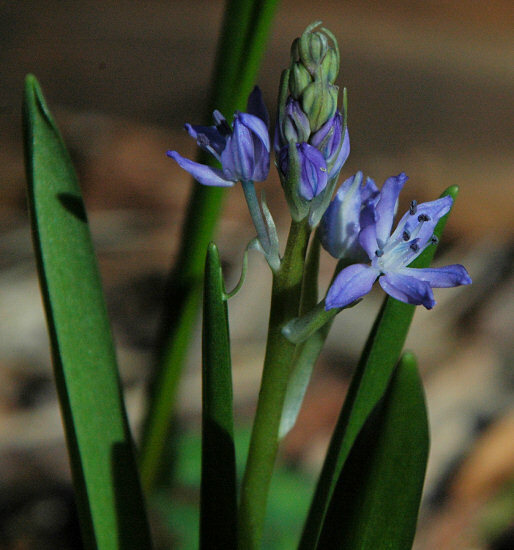 Hyacinthoides lingulata, syn. 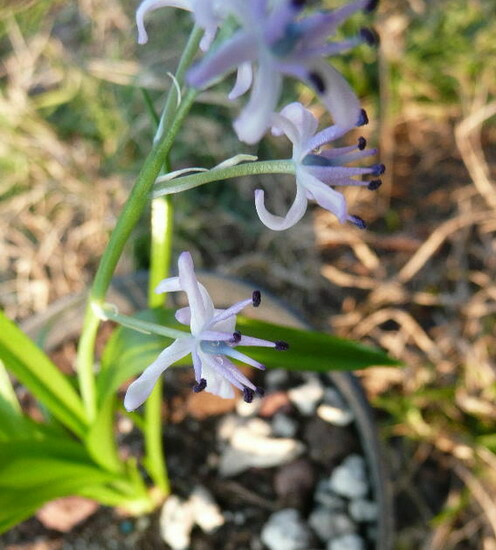 Scilla lingulata is a small but beautiful fall-blooming species native to North Africa. Both names are sometimes used and there is a var. 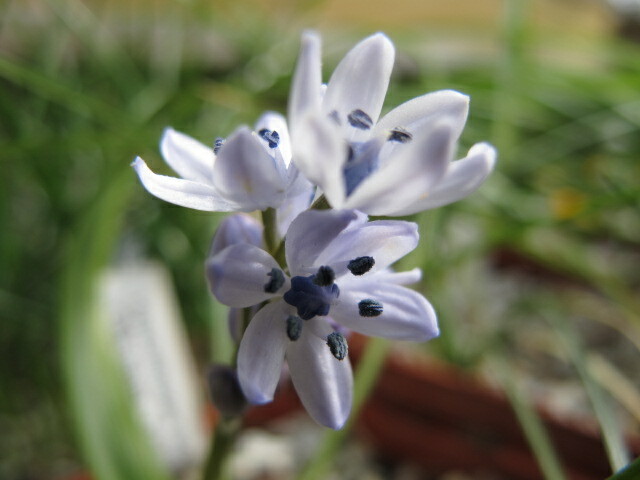 ciliolata named under Scilla but not recognized when considered Hyacinthoides. 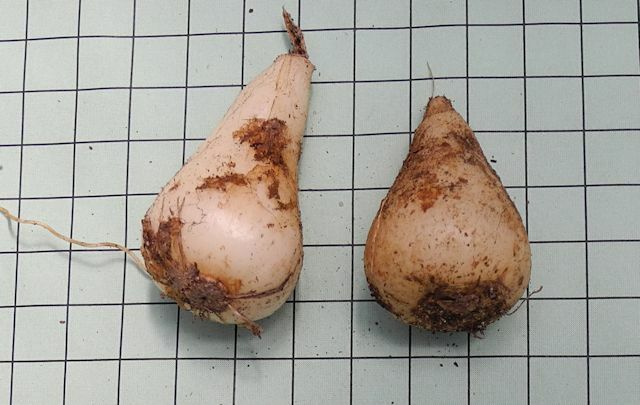 The plants in the 8-inch diameter pot in the first two pictures from Jane McGary are the increase of one bulb purchased 5 years prior from Monocot Nursery. 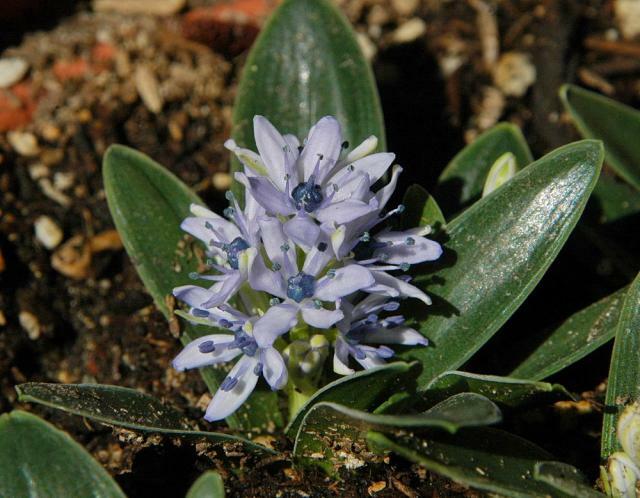 This species is grown for her in an unheated bulb frame where winter temperatures reach about 25 degrees F. The epithet "ciliolata" refers to the fine hairs on the leaf margins, visible in the photo. The third and fourth pictures are from John Lonsdale. 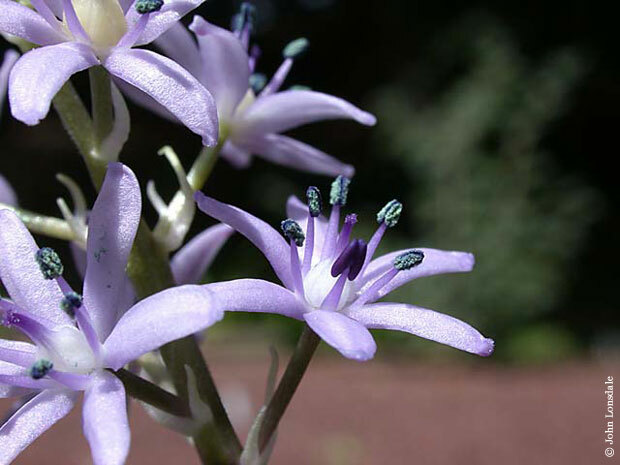 The fifth photo shown below and taken November 2003 by Lee Poulsen is of a plant grown by Harold Koopowitz from seeds collected in Morocco that is a very nice shade of blue. 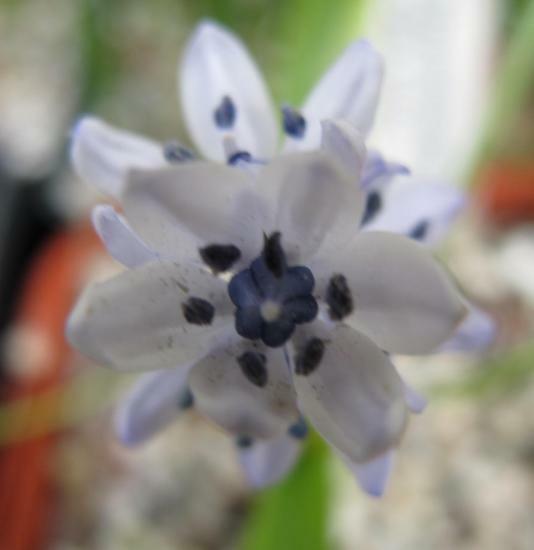 Photos below from Mary Sue Ittner show flowers can vary in color. 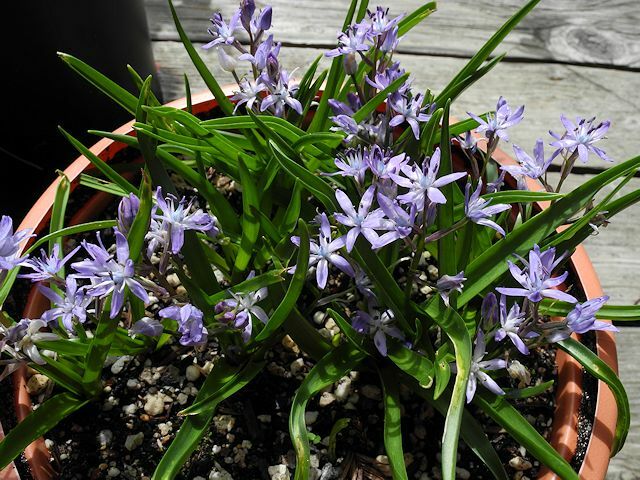 She grows these in pots in part sun/shade where they bloom one to two months after leaves emerge in fall and increase rapidly. 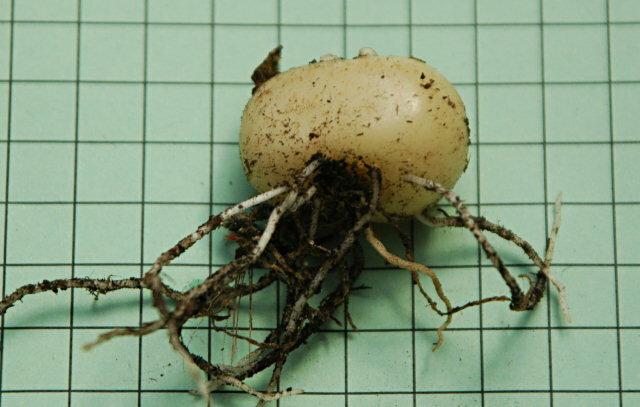 The last photo shows the bulb on a 1 cm grid. 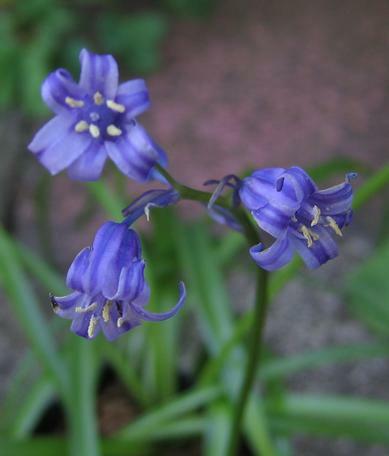 Hyacinthoides × massartiana is a hybrid of H. hispanica and H. non-scripta and is the common garden 'bluebell'. They will spread themselves and often have to be weeded out. From seed to flower takes about three years. They are available in white, shades of pink and purple and blue. Photos David Pilling. 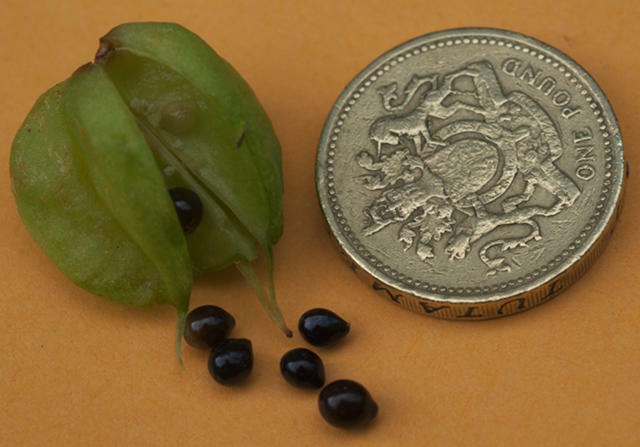 The first photo is of a seed pod and seeds (the coin is 22 mm in diameter); the second is of shoots appearing at the end of November 2012 in North West England; the third shows a complete plant on the 22nd of February 2015, the ruler is marked in inches. 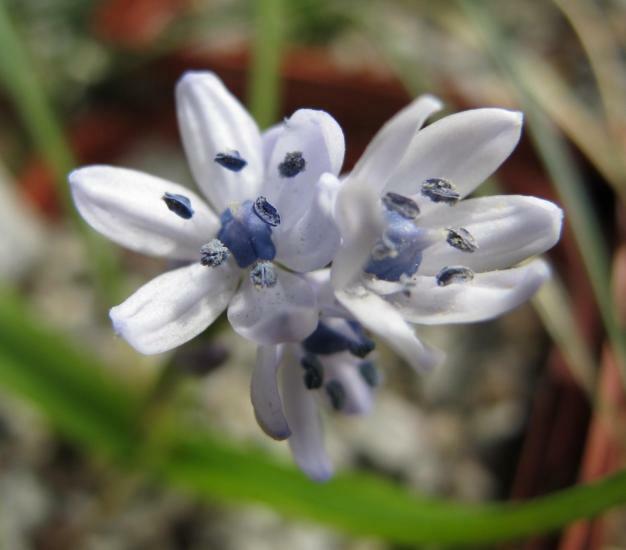 Hyacinthoides mauritanica (Schousb.) 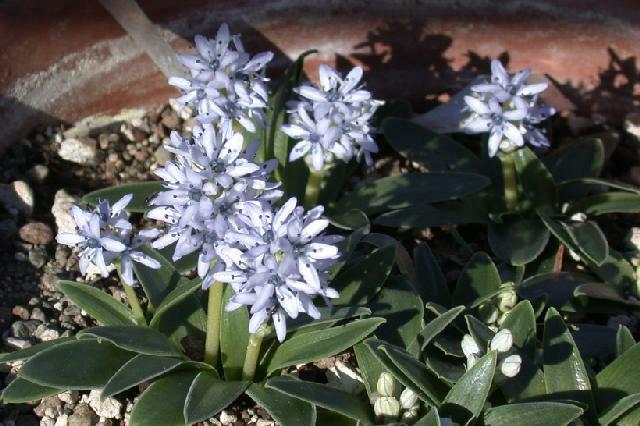 Speta includes two subspecies formerly included in Scilla. 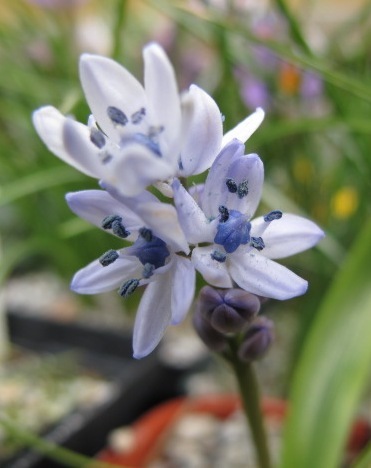 Hyacinthoides mauritanica ssp. mauritanica, syn. 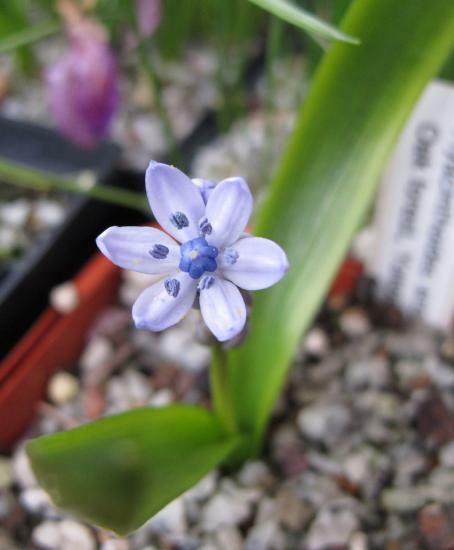 Scilla mauritanica, is a dwarf blue flowered species native to Portugal and Morocco. It blooms in spring. Photos from Alessandro Marinello. 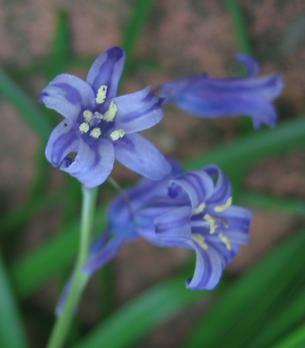 Hyacinthoides mauritanica ssp. vincentina syn. 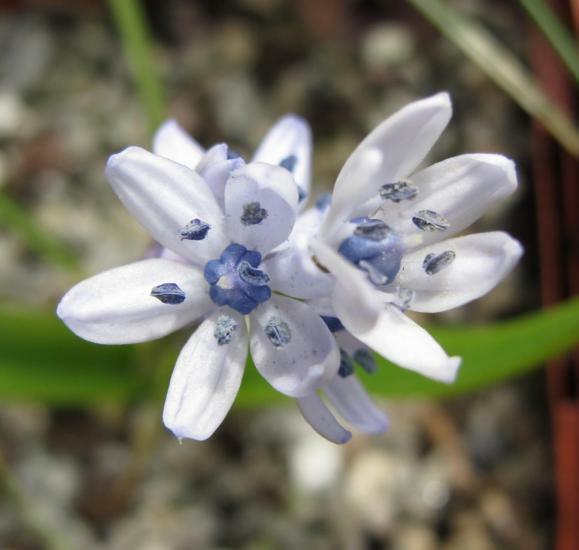 Scilla vincentina from southwest Portugal is also known and grown under the synonym Hyacinthoides vincentina. 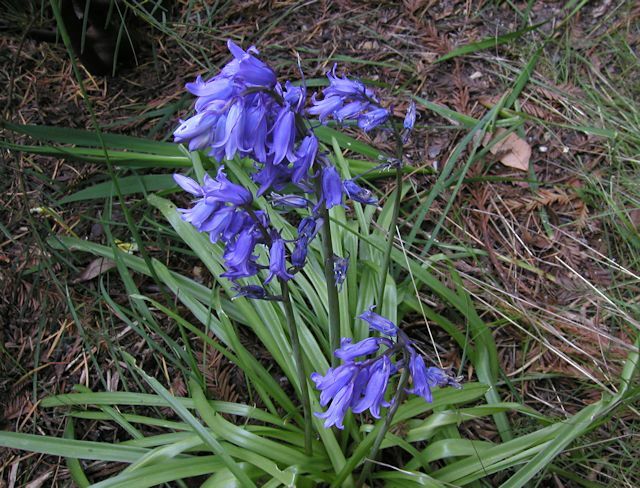 Hyacinthoides non-scripta is a native of Western Europe where it is found growing in woods and meadows. 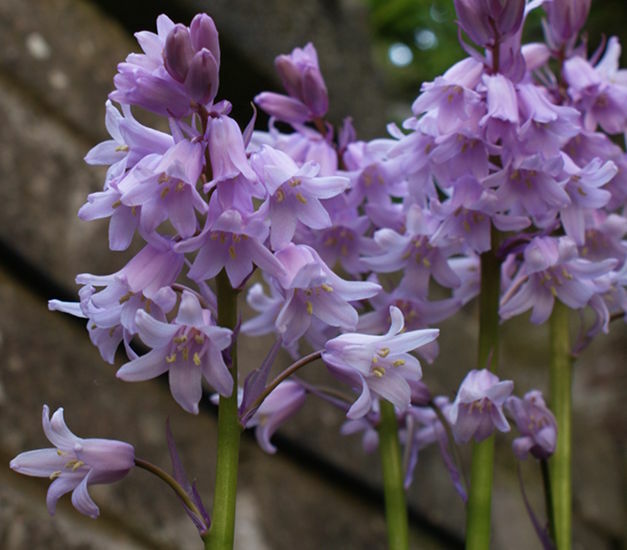 It grows in masses in the British Isles and is quite showy in spring. 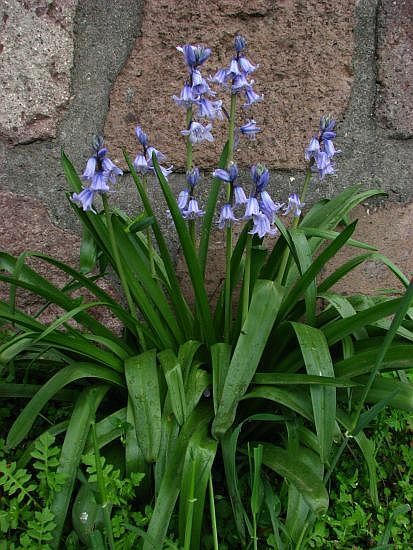 In England these plants are called Bluebells and in Scotland Wild Hyacinths. 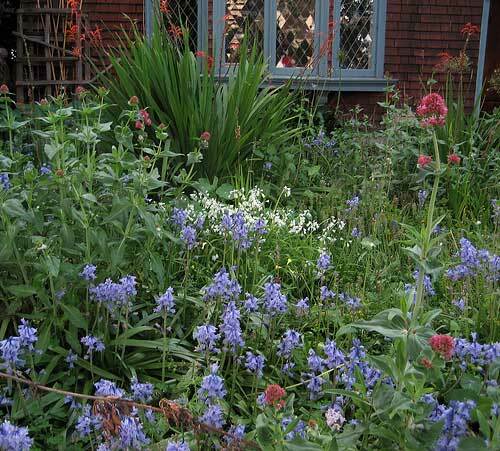 The photos below were taken in the UK in May 2004 by Bob Rutemoeller. 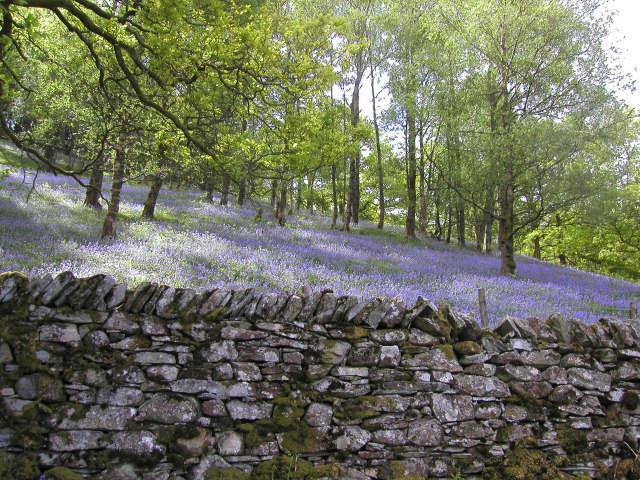 The first two were taken in the Lake District and show a mass of blue under the trees framed by a wall and a close up of the flowers which are usually blue and occasionally white. 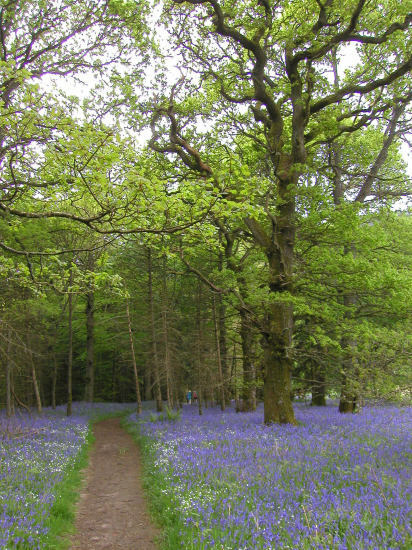 The last was taken in central Scotland showing a trail bordered by flowers. 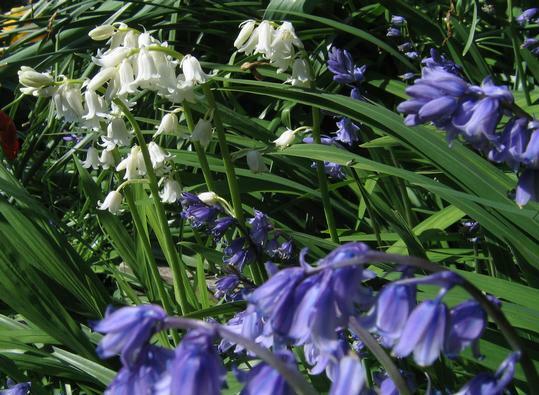 Conservationists believe the main threats to native bluebells in England are 'global climate change' and hybridization with 'spanish bluebells' (Hyacinthoides hispanica) escapees from gardens, for now they remain prolific. Compared with other species, H. non-scripta has white anthers, as against blue anthers. Photos David Pilling. 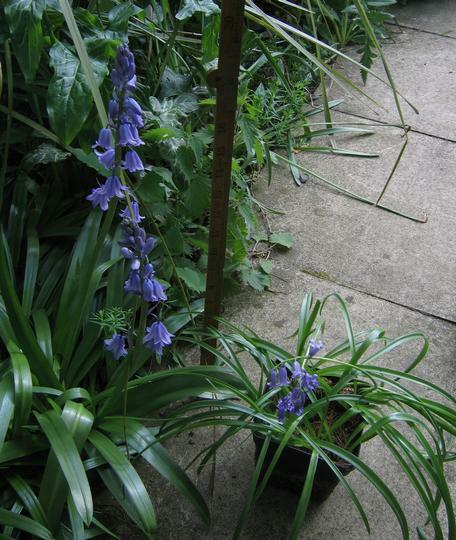 In these photos a black pot of non-scripta is shown next to a garden plant (probably Hyacinthoides hispanica). 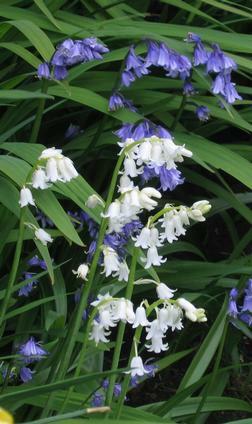 Note the drooping curved stems of non-scripta against the stout upright stem, the thin leaves compared with the broad leaves, the shape of the flowers and the way they hang, and the relative sizes of the plants. 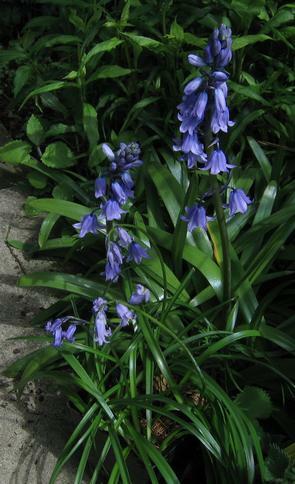 Hyacinthoides reverchonii, syn. 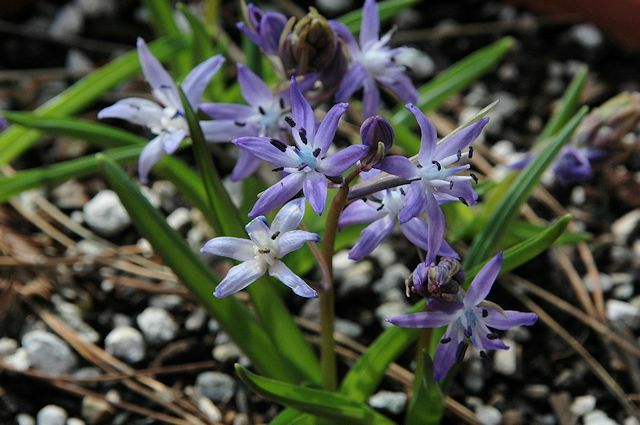 Scilla reverchonii from Spain has narrow leaves and loose racemes of blue flowers with purple stamens that hang to one side of the stem. 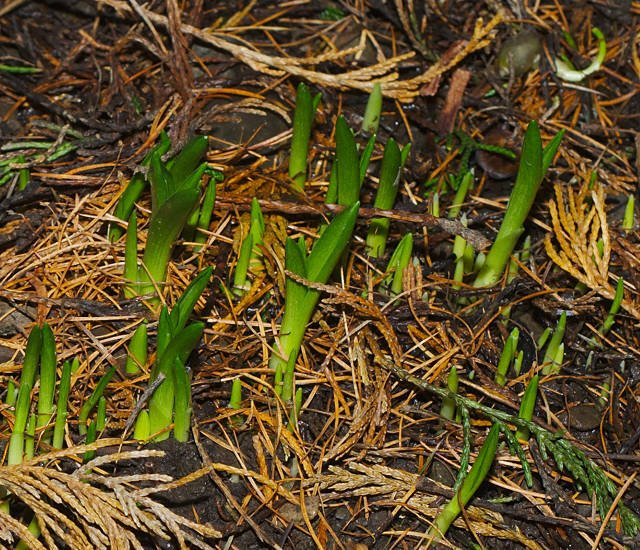 It is an early bloomer, blooming between February and April. Photos by Mary Sue Ittner. 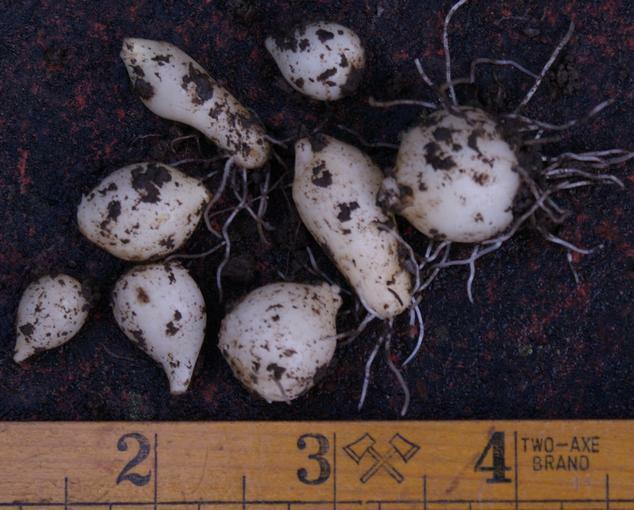 The last picture shows the bulbs on a 1 cm grid.